Able Distributors and Napoleon Chicago are committed to establishing a network of qualified dealers and providing those dealers with the opportunity to flourish. We are excited to announce the Napoleon Chicago Authorized Dealer Program. This program provides Napoleon Chicago Dealers with a competitive advantage in the marketplace and rewards them for making Napoleon a significant part of their business. The Napoleon Chicago Authorized Dealer Program is about equipping contractors for success. All members receive the benefits listed below in addition to access to Napoleon's HVAC catalog. Qualify for a dealer performance rebate of up to 2% on all Able purchases. Market protection through distribution limits based on sales performance. Receive a Napoleon Chicago Dealer Sales Kit containing a Napoleon polo shirt, baseball caps, a sales binder, sales brochures, and pens. Earn ongoing co-op funds at a rate of 2%. Access to a consumer financing program with aggressive rates. Improved profits through affordable extended service agreements/labor policies. Purchase an Ultimate 9700 Series furnace for either personal use or showroom display at a 25% discount. Receive product, sales, technical, and business training. Access to a Napoleon HVAC Product Module for your business website. Access to Napoleon marketing materials in Polish language. Opportunity to participate in the Napoleon HVAC Trip Program. In 1969, Wolfgang Schroeder and his wife Ingrid emigrated from Germany to Canada. By 1976, Wolfgang was manufacturing steel railings in Barrie, Ontario, Canada at a small fabrication business they had started. Wolfgang, who brought a technical engineering education from Germany, and his wife Ingrid built their first wood burning stove in 1979 using metal that Ingrid transported on the roof of her car. By 1981, the name Napoleon was born and now, a few decades later, they are established as a global market leader in gas fireplaces. In 2001, after perfecting the fireplace, Napoleon decided to set their sights on expanding the product offering into another segment of the gas-fired appliance market: gas grills. By 2003, Napoleon had launched an entire new division dedicated to high-end gas grills and outdoor products. Again, Napoleon’s dedication to design and innovation allowed them to redefine the industry standard for what a gas grill looks like and what it can deliver to the consumer. In 2011, Napoleon took a look at the HVAC market and realized that no company was making forced air equipment that lived up to Napoleon’s unrelenting standards for quality and aesthetics. Understanding how to bend steel, design heat exchangers, and control fire made the opportunity to build their own brand of furnaces a natural decision for Napoleon. 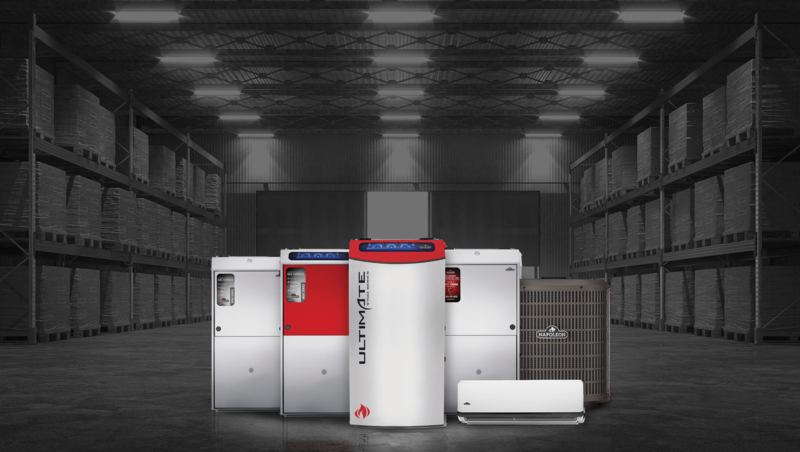 In five short years, Napoleon went from having no HVAC presence in Canada to securing a major segment of market share through uncompromising innovation. Now, in 2016, Napoleon is still owned and run by the Schroeter family with the same passion and attention to detail that Wolfgang started the company with back in his garage in 1976. They are recognized worldwide for producing a wide variety of design driven consumer products such as gas grills, fireplaces, and now HVAC equipment with uncompromising quality and integrity. The major element in Napoleon's success across markets is their dedication to craftsmanship. At the end of the day, Napoleon doesn't produce a product that Wolfgang himself would not be proud to put in his home. As a privately-owned company, Napoleon can prioritize design driven decisions that meet the unrelenting requirements for quality set by ownership. Buying into Napoleon isn't a one-way street, they have gotten where they are by being the best, not just selling the most. Napoleon's dedication to innovation and craftsmanship results in products that make life easier for contractors and more comfortable for homeowners. Whether you're installing it or living with it, there's a lot to love about Napoleon equipment. 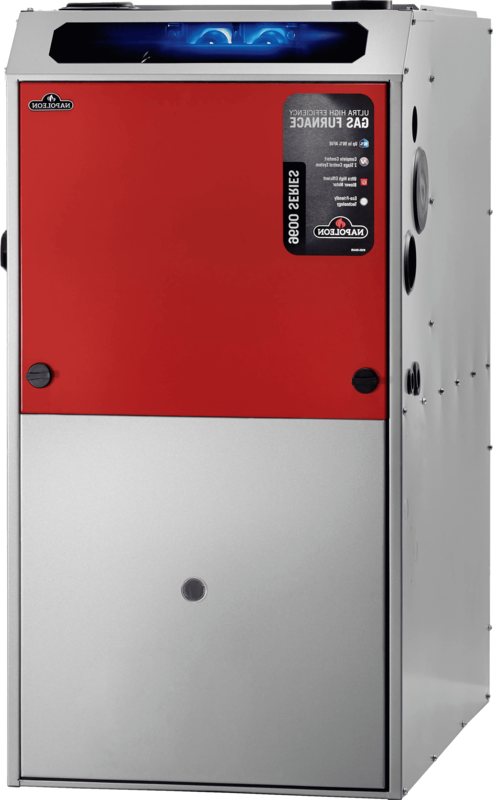 One look at the Ultimate 9700 Series furnace is all you need to know it's not like other heating solutions. The design is focused on efficiency and convenience. Thanks to the 97% efficiency rating and the variable speed ECM blower, homeowners can look forward to reduced gas and electrical bills. 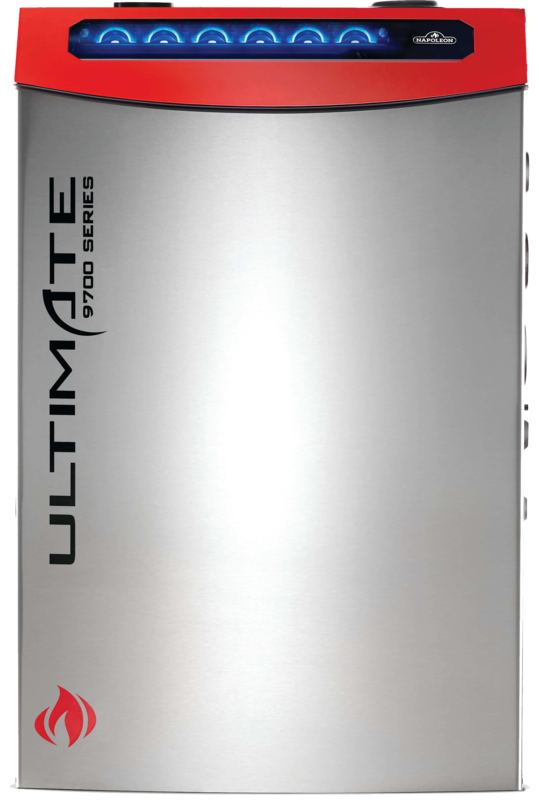 The Ultimate 9700 also features quality of life improvements in the form of built-in air purification and whisper-quiet operation. Contractors love the Ultimate 9700 Series because their customers love the Ultimate 9700 Series, but that's not the only reason. Installing, servicing, and maintaining these furnaces is a dream. The Ultimate 9700 Series is one of the most accessible pieces of equipment in the market thanks to design elements like automatic internal cabinet lighting and conveniently-located parts. 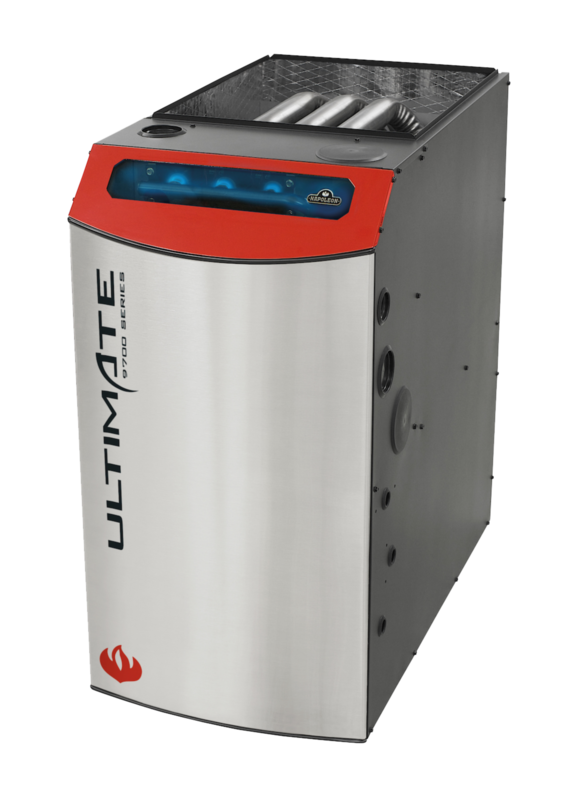 Ultimate 9700 Series furnaces are covered by a 15-year unit replacement heat exchanger limited warranty, a lifetime heat exchanger limited warranty, and a 10-year parts warranty. Heating is Napoleon's specialty, but their cooling equipment isn't far behind. Napoleon's selection of efficient, reliable air-conditioners makes it easy to design a Napoleon comfort system for any application. Napoleon's condensers, like their furnaces, are focused on providing quiet, high-efficiency comfort to homeowners and making life easier for contractors. The design emphasizes reliability and airflow efficiency to ensure consistent comfort. The hookups and connections are located directly behind a removable service panel, allowing contractors to get in and out of the unit quickly and easily.